NOTES: Bukkit is not yet released, your plugins will stop working if you proceed. If you want to upgrade your existing world, click upgrade. News and Updates / Miencraft v1.14 is here! 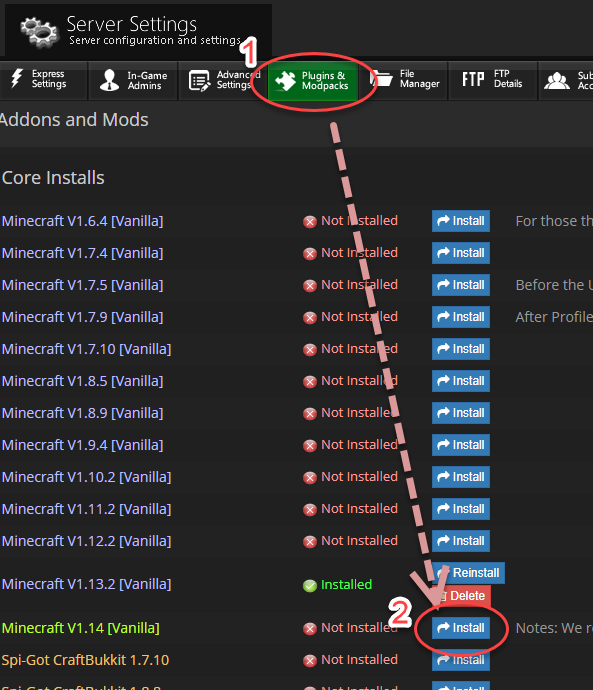 You can update your existing instance from the PLUGINS and MODPACKS section. 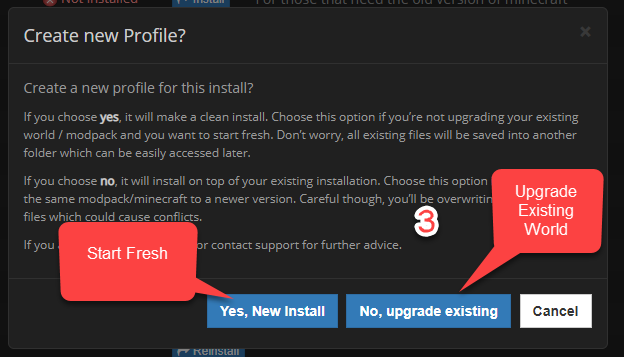 We recommend you start fresh but you can also click the Upgrade to convert your server over. News and Updates / Minecraft v1.14 is almost here! Snapshots for Minecraft v1.14 is now in its final pre-release stages! We have been testing and updating the control panel to support this ultimate release! Just remember, Bukkit version of Minecraft v1.14 may not be released for some time so don't upgrade if you need your plugins to work! News and Updates / More updates on its way! If you need to restrict or give access to only certain things to players, either its from other plugins or just general minecraft permissions, you are best to add a "Permissions system plugin" on your server. Many plugins have a permissions list which you can then use on a permissions system plugin to restrict or give access to players. There are a few permission system plugins you can use, but all require a bit of time allocated to learn how to use and troubleshoot. Note: Works on Minecraft 1.13 but not officially supported. Note: There a paid plugin which uses the in-game interface to set up permissions - to some its much easier. News and Updates / More servers galore! STIPE Servers Australia has reached a new peak! We have blown records, highest player online count, server count, and network peak all while maintaining epic support and lowest waiting times! We've upgraded many server boxes and added over 10 dedicated servers in just the last month. We'd like to thank our customers who have put so much trust in us! Option 1: Install a permissions system (LuckPerms, PermissionsEx, etc). This is powerful method and allows you to set permissions for each player or group. BUT it's very complicated and you will have to spend time learning the system. This will activate up the "player-commands" section which is located in the same file and give permissions to all players based on the list in the "player-commands" section. You can remove a command that you don't want them to give, but that's all you can do. You can't set up groups. Although we offer 5 day full refund change of mind guarantee, if you still really really really want to test out the servers, here they are! News and Updates / Backup upgrade! Currently customers on the linux system have to request for restorations via our support team. We understand this can be tedious for some customers who want to trial and error and need to keep asking for restorations over and over. We are happy to announce that backup systems have been upgraded to allow full control to the customer! You can now perform self-service restorations to any given hour! From our current test's the restorations are blazing fast and stable! We TNT'd up a very large world, and then restored it back to the way it was in just 13 seconds! For those having issues setting up a maplist and map rotation with workshop maps. Try the following, which will use the maps in your subscribed collection id. News and Updates / Minecraft 1.13 AQUATIC UPDATE released! Guess what!? The long long waited Minecraft 1.13 AQUATIC Update is finally released by our friends at Mojang! We are still waiting for Forge and Bukkit to release their updates for Minecraft 1.13. If you don't want to lose your plugins/modpack, stick with your existing installation for now. UPDATE: Both SPIGOT and CRAFTBUKKIT 1.13 versions have been released and can be installed from the Addons section of the control panel. News and Updates / So many updates! Its been a while since we provided an update, there has been so many that we've lost count! Over 170 Modpacks were updated several times in our database list over the past month. Updates were ranging from Feed The Beast, Twitch, AtLauncher, and custom built modpacks. Control Panel has been steadily updating, mostly stability fixes. 4 mins response and 16 min resolve times over the past 8 months! We had an issue with the Control Panel causing some serious lag. Unfortunately we were not aware of the issue as it would only occur at a customer login level. The issue has now been resolved. Apologies for the inconvenience. Our Teamspeak 3 server has been updated, only clients version: 3.1.8 will now work. If your client is not the latest version, please update it now.